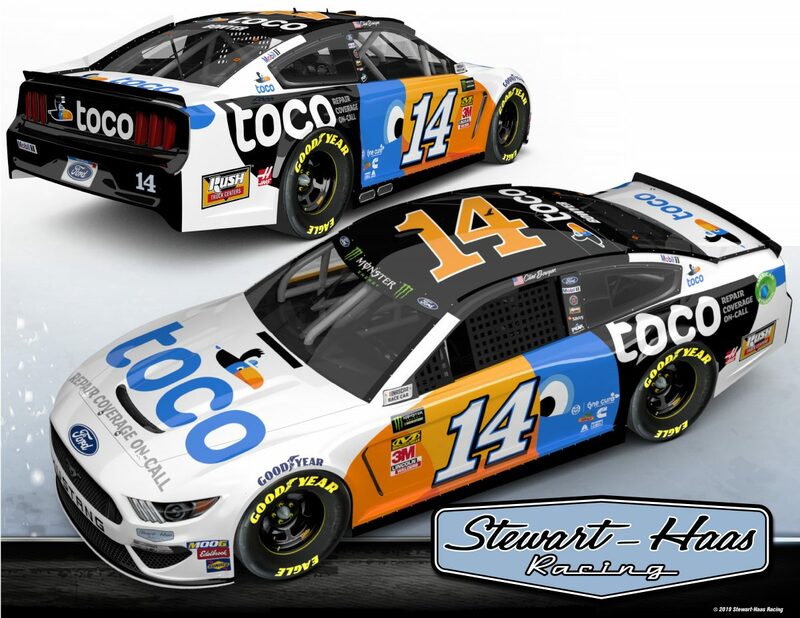 Toco Warranty Corp., a new generation of vehicle service contracts (VSC) with pay-as-you-go monthly plans, has partnered with Stewart-Haas Racing (SHR) in the Monster Energy NASCAR Cup Series by serving as a four-race primary sponsor of driver Clint Bowyer and the No. 14 team. Augmenting this sponsorship is Toco Warranty’s association with Tony Stewart Racing (TSR), where it will be the co-primary sponsor of 10-time and reigning World of Outlaws Sprint Car Series champion Donny Schatz and an associate sponsor of Stewart, who is slated to compete in more than 90 winged sprint car races this year. Communicating this message to anyone who owns a used car or is in the market for a used car is a key component of Toco Warranty’s partnership with SHR and TSR. SHR has won two NASCAR Cup Series championships and one NASCAR Xfinity Series title while TSR has earned nine World of Outlaws championships. Becoming involved with two title-winning teams at the pinnacle of North American motorsports is why SHR and TSR align so well with Toco Warranty. Founded in 2013 and based in Southern California, Toco Warranty’s mission is to offer drivers simple-to-use and financially smart vehicle repair coverage that can be purchased using a monthly payment plan. Backed by an A-rated insurance carrier, the company offers vehicle service contracts nationwide as well as mechanical breakdown insurance for California residents. Toco gets it done for drivers with cars five years and older through plans that cover parts for a car’s engine, transmission, drive axle, electrical, cooling system, AC, fuel system and more. Toco’s promise to put customers first is supported by convenient tools and benefits, from the MyToco customer portal and 24/7 roadside assistance to a dedicated concierge and the Ethos Council, which was designed to encourage transparency and ethical practices across the company. For more information about Toco Warranty, visit www.TocoWarranty.comand follow us on Facebook at www.facebook.com/TocoWarranty, on Twitter @TocoWarrantyand on Instagram @TocoWarranty. Stewart-Haas Racing is the title-winning NASCAR team co-owned by three-time NASCAR Cup Series champion Tony Stewart and Gene Haas, founder of Haas Automation – the largest CNC machine tool builder in North America. The organization fields four entries in the Monster Energy NASCAR Cup Series – the No. 4 Ford Mustang for Kevin Harvick, the No. 10 Ford Mustang for Aric Almirola, the No. 14 Ford Mustang for Clint Bowyer and the No. 41 Ford Mustang for Daniel Suárez. The team also competes in the NASCAR Xfinity Series with two fulltime entries – the No. 00 Ford Mustang for Cole Custer and the No. 98 Ford Mustang for Chase Briscoe. Based in Kannapolis, North Carolina, Stewart-Haas Racing operates out of a 200,000-square-foot facility with nearly 400 employees. For more information, please visit us online at www.StewartHaasRacing.com, on Facebook at www.Facebook.com/StewartHaasRacing, on Twitter @StewartHaasRcngand on Instagram @StewartHaasRacing.